We’re proud to share the news that cyber security portfolio startup, ResponSight has raised a US$880,000 round led by Carthona Capital. The round also included a follow-on investment from Black Sheep Capital. ResponSight’s technology detects hackers using behavioural analytics, using differences in user activity to proactively alert and isolate threats. Based out of Melbourne, ResponSight earlier raised US$57,450 in 2015 with BlueChilli’s Disrupt@Scale programme with corporate partner Westpac, enabling the ResponSight team to build out the MVP, validate the market and commence pilot enterprise customer trials. 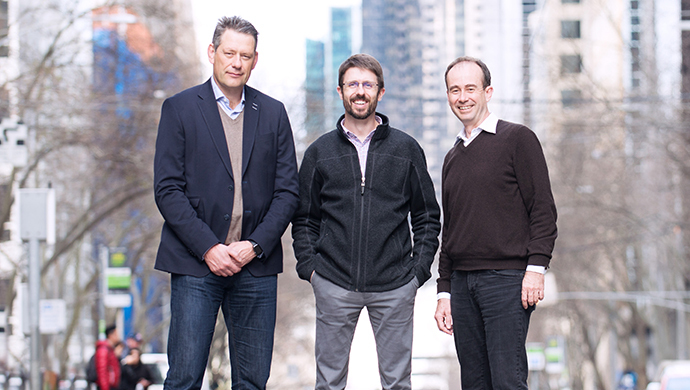 Image Credit : Alex Pott L-R : ­ Dean Dorrell, Partner at Carthona, Jeff Paine, CEO at ResponSight, James Synge, Partner at Carthona. The funds will be used to accelerate the company’s international growth in 2016/17, with a significant portion going towards hiring new staff and building the infrastructure to support the company’s global outlook. Traditional security offerings have been built upon years of legacy ware and inefficient reactive tactics. Already working with a number of companies in the banking, finance, superannuation, and professional services sectors, ResponSight utilises UEBA (User and Entity Behaviour Analytics) technology to identify threats based on unusual user behaviour. ResponSight works on the endpoint, as close to the actual user as possible, rather than just a loose association through distant logging alone. “Australia has had few security companies in recent years, so this round is the testament to the Australian startup scene –we can do what Silicon Valley and Israel do. Gartner predicts the cybersecurity market will reach US$62.50 billion in 2016, so ResponSight is well placed to take advantage of this,” said Jeff Paine, CEO of ResponSight, announcing the funding.